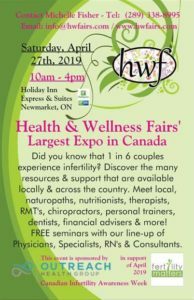 Health & Wellness Fair – in Support of Fertility Matters. We’ll be offering discounted Ensofic Ray (Reiki) sessions all day! Please join Health & Wellness Fairs’ largest expo in Canada in Support of Fertility Matters. Meet and greet your local health and wellness professionals. Discover the many resources and support available. Free seminars, yoga, meditation, Zumba, and fitness classes. First 100 attendees will receive a free gift from our sponsor GoodLife Fitness Newmarket York Town Square.